This entry was posted on Saturday, November 17th, 2012 at 3:11 pm	and is filed under British Columbia, cities, politics, urban planning, Vancouver. You can follow any responses to this entry through the RSS 2.0 feed. You can leave a response, or trackback from your own site. Wow. What makes the unsurveilled areas different? Really rich? Really poor? Erica – I have no idea. 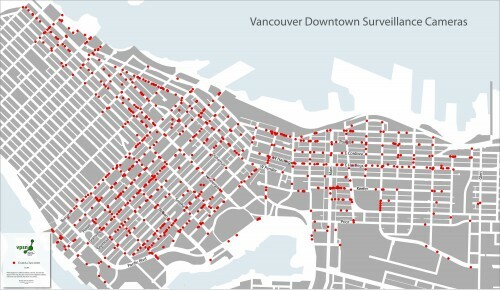 I’d be interested to know the following: are these all publicly-owned (police) cameras or are (as I suspect) most of them private cameras mounted by the building owners or businesses. Which ones can police access and what is required for them to access private feeds? Etc. It’s so strange that the whole western/northwestern area has no cameras at all and they’re so dense everywhere else. I can tell you my one experience with wanting a surveillance camera — a few years ago, someone started banging on my door in the middle of the night and appeared to be trying to force his way in. I called the police, they did nothing (thanks, guys). The following morning I was telling a friend the story and she mentioned that there’s a surveillance camera at the end of the street. I called the police to see if they could review the footage and they said they only kept it for two hours or something bizarre, so there was nothing to review. Ha. That sounds like a conceptual art piece, not policing.